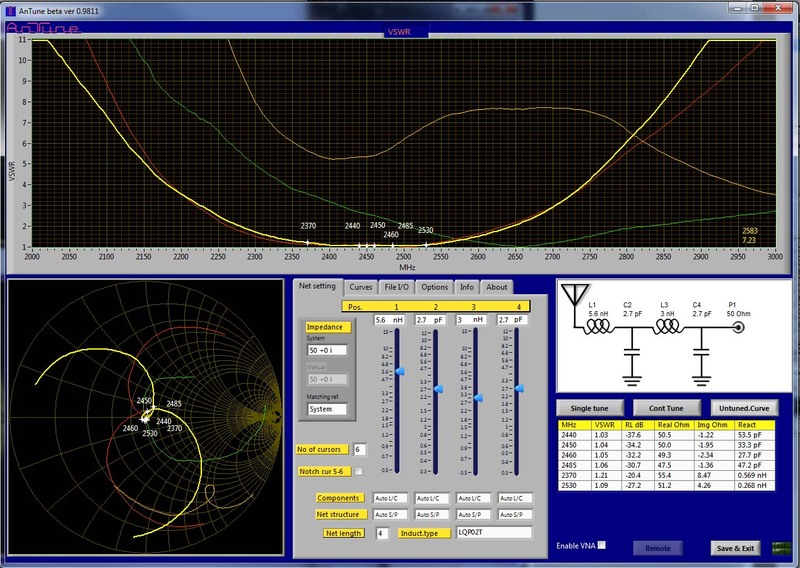 AnTune VNA antenna impedance matching network software. 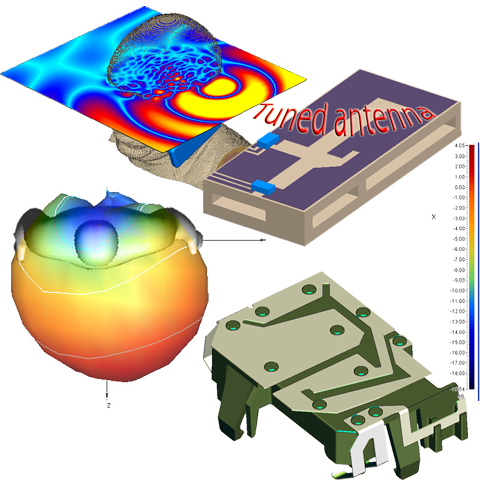 AnTune software assist designing antennas and RF impedance networks. Runs on PC/Windows and can communicate with a Vector Network Analyzer over GPIB/USB/LAN for automatic design optimizing. 18th September 2017 - AVX component libraries are now avilable for download. 4th April 2017 - AnTune is now supporting VNA's from Copper Mountain Tech. The combo of Copper Mountain Tech. VNA and AnTune is probably the most effective solution for all kinds of RF impedans-related design work as it gives so far highest data rate. Time for freq.sweep to presentation at PC of a optimized network is typical ~0.2 second. 20th February 2017 - Murata latest models are now included in AnTune library. AnTune measurement software delivers live optimized network matching results based on data live feed from a VNA or by importing S-parameters from file. Main focus is to improve embedded antennas and SMD RF filter performance. AnTune can auto-select best network topology and number of poles or by your preferred topology. Select your preferred type of inductors and capacitors, many preinstalled, or add your preferred brand and type. It is easy to add compensations for hand-effect, TIS and TRP-curves, setting for wanted high loss at certain frequencies, conjugate matching from any complex curve to any complex curve and much more. AnTune is not a theoretical software, it is a lab-bench tool developed for RF engineers, by RF-engineers, with intension to find effective solutions that are hard to find with conventional simulation and impedance matching tools and at the same time simplify and reduce development time from weeks to hours. Implementing a calculated network the conventional way can be problematic even if calculated components are based on measured parameters such as S11 or Spice. AnTune has the tools to ensure that final measured network results comes very close to the from beginning predicted result. It is when designing real complex RF circuits and multiband embedded antennas that AnTune is in a special class. Any adjustments of antenna structure and matching network is automatically recalculated with no delays. It allows you to find best network+antenna combinations that previously not been possible with common types of impedance matching software. AnTune adds or improves functionality for many types of VNA's such as setting of any system impedance, even complex values are possible, improved automatic port extension, curve math functions, averaging, smoothing, component identification. Also real old HP VNA's are supported and will get multicolor curve functionality, 4 curve memories, a lot of marker functions. All on a big PC-screen instead of a small display with curves in dim green color on a darker green background. Results can be displayed in many formats as live charts, tables, schematics and exported as Touchstone or jpg. Full report generation can be saved as HTML. For an average fast computer is computer screen updated within less then 0.3s from when VNA have data to deliver. Delay time includes computing time for an optimized matched network. If you can handle a VNA is learning curve almost none as most settings are done automatically in software and there are no fancy multilevel sub-menus with cryptic settings. Just start AnTune and find out why this tool will give you numerous advantages that not exist in any else software. Most of the buttons and menus are self-explaining. Every function have a popup-description (that can be turned off). A VNA with GPIB/USB/LAN connection is needed for full use of AnTune advantages but it is also possible to exercise dry-swimming by import/export Touchstone files. AnTune will simplify your next project. Cutting development time with 50%. Reaching improved final results. Detailed result and measurement protocols are created with minimal effort. If you want to use AnTune for your next project or just want a free joyride, welcome to download a fully working trial version here..
for many types of RF related jobs. AnTune is fully functioning but development is constant ongoing. That is how we want AnTune to be. Improvements and functions will be added from time to time. To let RF & antenna designers verify that this software in current status fulfill what it promises, is it free to download as a fully functional trial version. Are you missing a function in AnTune? Can something be improved? With your feedback, both positive and negative, can AnTune be developed to become even better. Welcome to contact us by mail or in our social forums.